You can fill your Envelopes directly from your income. Click on the "Fill Envelopes" button to get started. 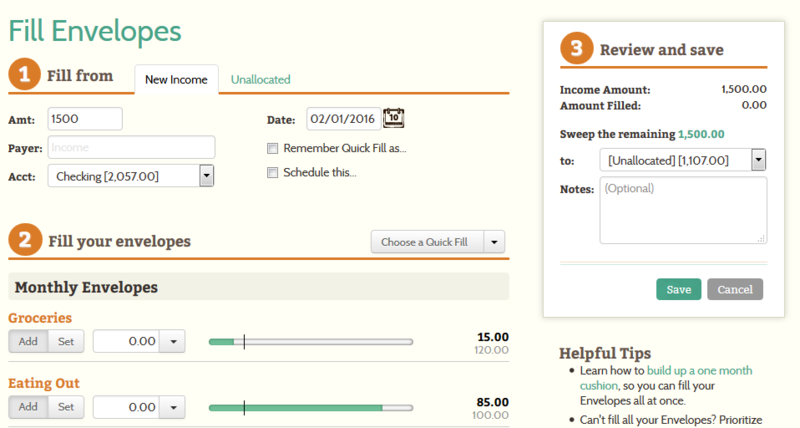 Fill from... New Income and enter how much the income is for and which Account you want to add the money to. Choose how you would like to distribute your income to your Envelopes. Choose an Envelope you'd like to sweep extras or deficits to, then click "Save." Not ready to fill your Envelopes with your income? You can pool your paychecks in Unallocated Money and fill your Envelopes when you're ready.